DARLINGTON SENIOR Kennedy Wagner finished off her prep golf career by placing 20th overall at the WIAA Division 2 Sectional Meet at Middleton’s Pleasant View Golf Course. POSTED October 12, 2018 11:12 a.m.
MIDDLETON – The season came to an end for the Darlington Redbirds girls’ golf team following a seventh-place finish at the 2018 WIAA Division 2 Sectional Meet hosted by Edgewood/Sacred Heart at Middleton’s Pleasant View Golf Course on Tuesday, Oct. 2. The host Crusaders claimed the sectional team title with a score of 337, while Arcadia topped Edgeton in a one-hole playoff, 24-25, to capture the second state team berth after tying for second-place with rounds of 375. The Redbirds placed seventh at the eight-team meet at 425. “I was very proud of the team’s performance at the sectional meet. The team score was the second best we had all season on 18 holes, and it was on a bigger course than most we have seen this season. The girls gave it everything they had and that’s all I can ask for,” said Redbirds’ head coach Molly Rice. Senior Kennedy Wagner carded a 49 on the front nine and a 48 on the back nine to lead the Redbirds by placing 20th overall with a 97. Junior Marissa Gould followed in 26th at 101 (51/50), while junior Maggie Nordqvist placed 36th at 110 (55/55) and senior Chloe Muhlstein took 42nd at 117 (62/55) to complete the team scoring at the sectional. Senior Holly Ray was 48th at 145 (72/73) for the ‘Birds. “This season was fun with a lot of success, individually and as a team. They worked hard during the summer and that paid off during the season. I couldn’t be happier with the team’s performance this season,” replied Rice. Aquinas senior Annie Balduzzi carded a 6-over 77 on the day to win individual medalist honors at the sectional and lock down a state berth. 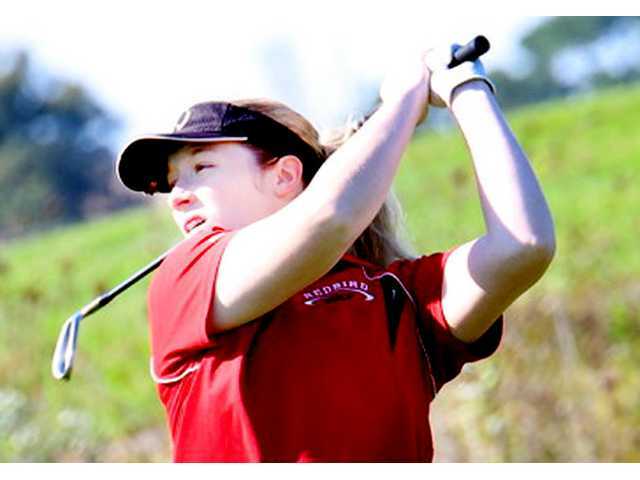 Edgerton senior Makenzie Suhr earned the second individual berth by placing fifth with an 86, while her senior teammate Maddie Perkins won a playoff against Osseo-Fairchild senior Keila Kittelson to claim the final state berth. Those two tied for sixth overall at 90. Along with Wagner– who was completing at her third career sectional meet– and Muhlstein and Ray– who participated in their first sectional, the Redbirds had seniors Jada Glendenning and Hannah McCarthy finished their prep golfing careers as members of a sectional team. Sectional Medalists: Annie Balduzzi, Aquinas, 77. Individual State Qualifiers: Balduzzi, AQ, 77; Suhr, Edge, 86; Perkins, Edge, 90 (Perkins won a one-hole playoff over Kittleson, OF, to earn final state berth). Darlington Individual Scores: Kennedy Wagner 97 (49/48), Marissa Gould 101 (51/50), Maggie Nordquist 110 (55/55), Chloe Muhlstein 117 (62/55), Holly Ray 145 (72/73).